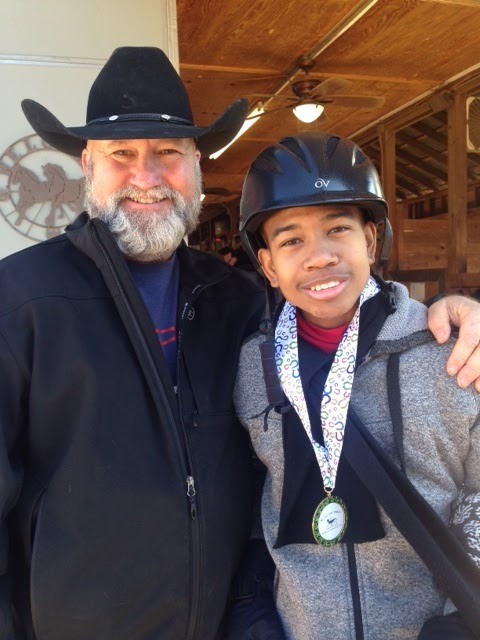 When we learned that Johnathon had won the medal for Focus at McKenna Farms Annual End of Year Horseshow at McKenna Farms in February, we wanted to know more about this amazing young man. Johnathon is fourteen; he’s been diagnosed with autism. He stopped talking at three and a half years old. The next few years were up and down for him. A team of very helpful clinicians and teachers worked with him for two years. Then, his teacher left. Johnathon slipped back; once again he no longer talked. But in May, his mother, determined to find a new program for him, discovered McKenna Farms. After his first visit, he came home excited and eager to tell his dad multiple details about his experience at the farm. Since then, he’s begun to thrive, and once he discovered the horses, Johnathon’s been on an upward trajectory. He loves his horse, Coal, and Coal stimulates him to do excel. Jacob’s Fund is thrilled with Johnathon’s accomplishments and we are grateful to be a part of his growth as he works hard to reach his full potential. “He is a unique young man with unlimited potential. His focus and drive earned him the Focus award,” said Bryan, his therapeutic riding instructor. We’re cheering Johnathon on and we hope you do, too. If you’d like to learn more about Jacob’s Fund, or would like to volunteer at one of the facilities we partner with, please contact us at 513-423-0108. We’re grateful that you want to help Johnathon and our other Jacob’s Fund’s Kids live the fullest possible lives. Thank you. I’m wearing a long red fleece jacket on this cold day. If you haven’t donned your red duds yet, take time to do that when you’ve read this post because today is WEAR RED DAY! February is Heart Month. Many of you know the story of our Jacob, in whose memory Jacob’s Fund exists. Jacob was born with multiple heart defects and underwent several open heart and other surgeries. It was after his last surgery that he contracted MRSA in the hospital and died six weeks later. What you may not know is that severe heart defects can result in developmental delays and impairments. When Jacob began hippotherapy at McKenna Farms in 2006 at age two, he hadn’t yet begun walking. Once he began hippotherapy (therapy using the horse as a tool), he walked, and ran, and his speech and vocabulary expanded immensely. I’ll never forget when he asked, after seeing me wear one, “Grandma, can I have a pedometer?” Uh, yes! I clipped it to his diaper. 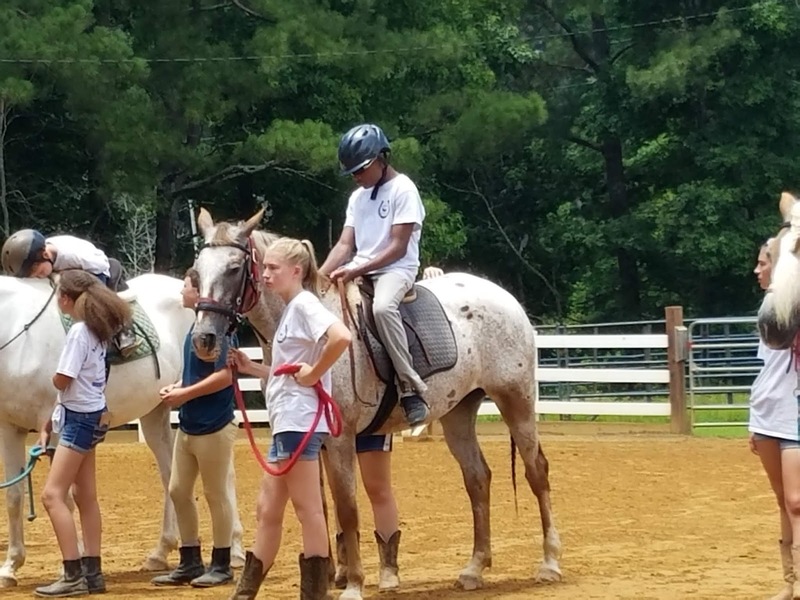 Since we founded Jacob’s Fund, we’ve been able to help kids with all kinds of impairments through hippotherapy and therapeutic riding. Some of these delightful children have heart defects. Among them is Jonah, who has some of the same heart defects that Jacob had. Part of his heart is missing on the left side. Jonah has a mass of gorgeous blond hair, big eyes and a mischievous grin that tells you right away that this boy has a great sense of humor. We met him before he was old enough for preschool, but now he’s in school and doing well. Jonah’s family makes every effort to help him and seek out the necessary services that he needs. Life with multiple heart defects means many hospital and doctor visits all along the way. As I think about our wonderful Jacob, several other children we’ve learned about come to mind: Timothy, Luka, Charlie. All of them are dealing with multiple heart defects. They, like us, fervently hope and pray for help and healing for their children. While we can’t magically make that happen, we can do something. Contribute to the American Heart Association. Donate to Jacob’s Fund. And WEAR RED today! Now’s the time to show your colors. 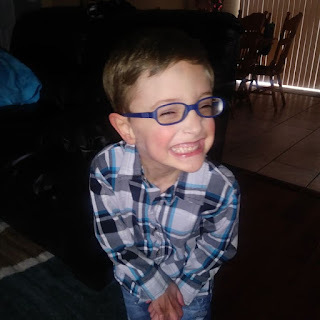 This smiling four-year-old is Jaxon. “Our sweet boy . . . truly a miracle and blessing,” says his mom, Brittany. Jaxon was born at twenty-three weeks. He weighed one pound, four ounces, so small he could be held in one hand. Jaxon spent the first six months of his life in intensive care. Those are the statistics, but they’re not the sum of Jaxon’s life. He’s a pre-kindergartener with a love for horses, and horses are what are helping Jaxon overcome some of the developmental delays a preemie like him has to deal with: speech difficulties, fine and gross motor skill delays, and developmental delays. Jaxon has had multiple eye surgeries, and continues to work on balance and muscle strength. It’s exhausting work for a little guy. He’s worked hard in clinical settings, but on a horse . . . well, therapy delivered while a child is riding a horse isn’t work - it’s fun! Underneath all the fun, though, real work is going on inside Jaxon’s body. The horse’s movement mimics the movement of the human pelvis, and the neural and muscular pathways respond to that movement. Speech and vocabulary improve, Jaxon’s core is strengthened and he builds skill upon skill with each hippotherapy session. Jacob’s Fund is so happy to provide Jaxon with a hippotherapy ridership. He’s come so far since he entered the world way too early. 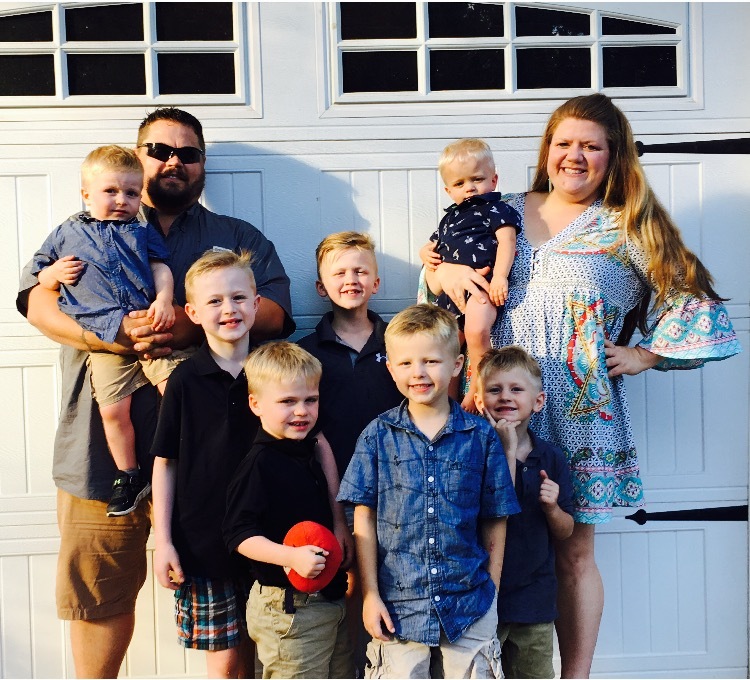 He’s still on a journey to meet developmental milestones and gain strength, and Jacob’s Fund wanted to be a part of that. December 1, 2002. A little boy, not quite a year old, finds himself in a new home. Linda, his new mom, bathed him and then rocked him all night that first night. He looked frightened and wary. “I was not sure that Moshe would walk or talk but I did everything I could to help him . . . “ She has two other children. All are adopted, and all have special needs. Today Moshe is “my sports/gadget/techie kid.” He’s good at math, though he needs to improve in reading to be at grade level. Moshe loves sports despite his medical challenges. He’s also his mom’s “natural born cowboy,” who loves his therapy horse, Ace, at McKenna Farms. 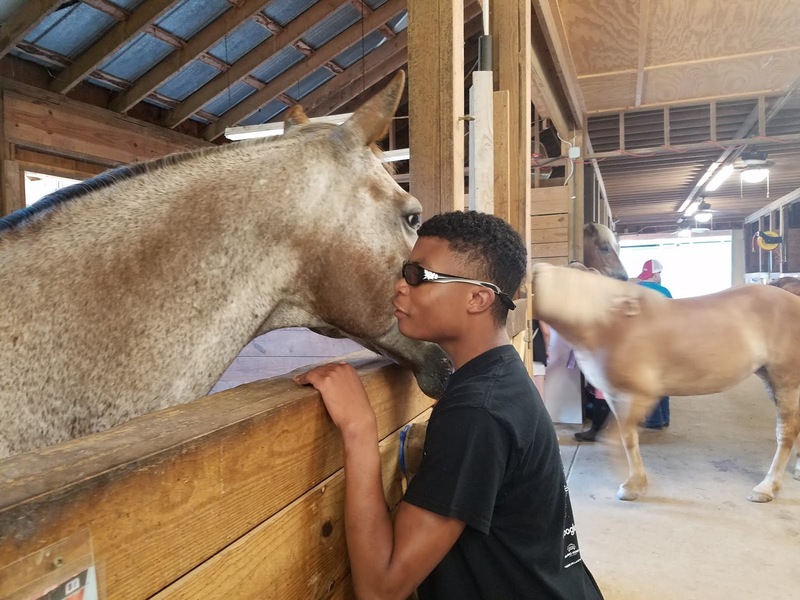 He hopes to be part of the farm’s Equestrian Special Olympics team. With three children who need therapy and who have multiple physical impairments that require medical attention frequently, Linda cannot afford the cost of therapeutic riding, though it means so much to Moshe. So Jacob’s Fund has begun covering the cost for Moshe’s sessions. Though funds are limited, Linda and Moshe have found a way to give back. They’re now volunteers at McKenna Farms, cleaning out horse stalls. 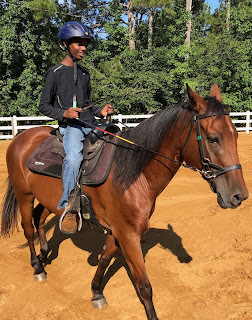 While it’s not the most glamorous volunteer activity, the extra time at the farm gives Moshe an opportunity to spend more time with the horses he loves. 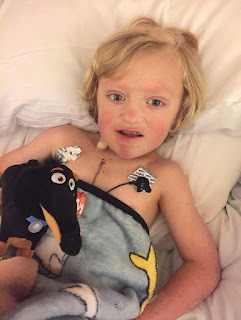 We hope Moshe’s victories warm your heart as much as they do ours here at Jacob’s Fund. Next Tuesday, November 27, is Giving Tuesday on Facebook; We will create a fundraiser that day to help cover the costs of Moshe’s therapeutic riding, as well as hippotherapy and therapeutic riding for the eleven other children Jacob’s Fund is currently supporting . It takes only a few seconds to make a donation on our Facebook Page - Jacob Beachy Fund – using the Donate button. Your donation makes a life-changing difference for children. We hope you'll donate next Tuesday. This letter brought me to a tear-filled standstill. 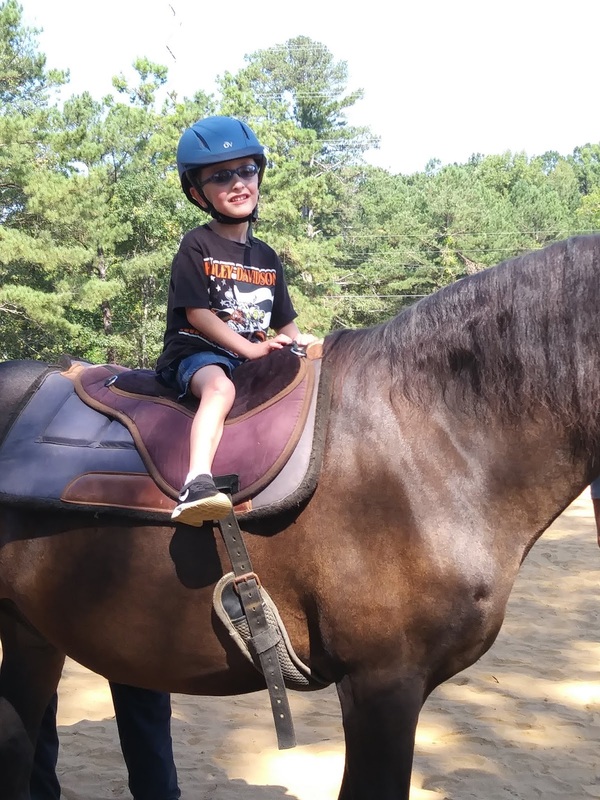 In the midst of a busy spring and summer for Jacob’s Fund (thanks to you, we’re providing more Jacob’s Fund riderships than ever before!) We’d slipped into a flurry of activity without having time to let each child’s individual story sink in. We have a request – do we have an application? How about the necessary documentation? Did we have a conversation with the parent? The therapist? While processing requests never becomes simply a matter of checking all the boxes, the need to do things right (and right now) with as many as twenty-five children current Jacob’s Fund Kids has kept us hustling. It’s overwhelming to think about the number of children with desperate needs to learn to walk, feed themselves, write their names, speak, and interact with others. The process takes time, but we move as quickly as possible, because, as Georgia’s program to that provides support to families of children with special needs says, babies (and children) can’t wait! We’re never in doubt that the kids who receive hippotherapy or therapeutic riding benefit greatly. We know that they stop banging their heads against car doors on the way home after a session on a horse. We know they delight their families when they begin talking and expanding their vocabulary. We know they begin to interact with siblings and schoolmates. We know that, but . . . nothing says it like this letter from a child who has had more than his share of hard knocks in life. David is thirteen. His mom adopted him when he was two. When he was three, he was diagnosed with fetal alcohol syndrome. I cannot express the heartbreak I feel hearing that. 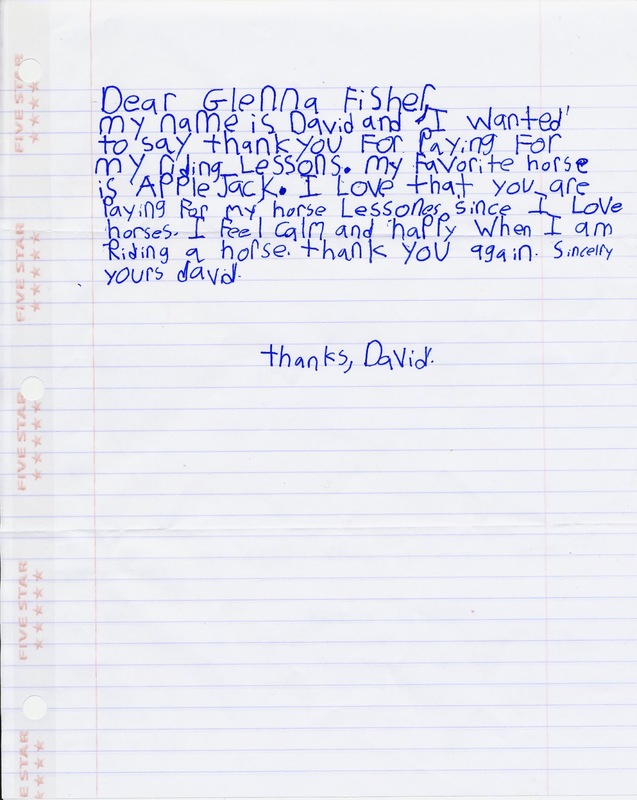 Thank you for your letter, David. We’re thrilled that you are calm and happy when you are riding a horse. May you ride many happy miles. Want to help? 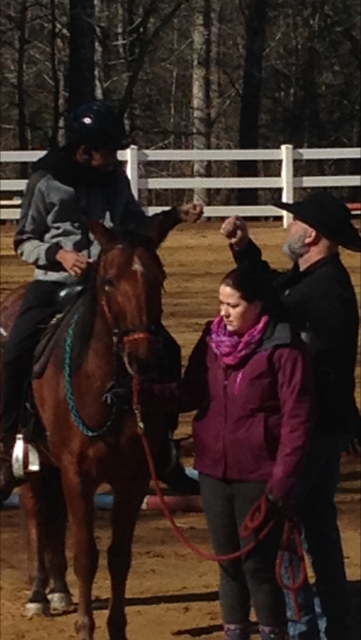 You can ensure that this little boy is able to continue therapeutic riding. We now have an easy way to make your donation. Please go to our Facebook page, Jacob Beachy Fund (https://www.facebook.com/JacobBeachyFund) and click the DONATE button (it’s just below Jacob’s name at the top). 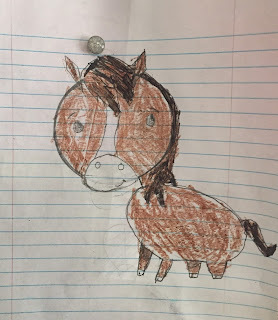 We always want you to know what we are doing at Jacob’s Fund with the money you donate to provide hippotherapy and therapeutic riding to children with developmental impairments whose families are unable to pay for using a horse as a therapy tool. There is a reason Jacob loved McKenna Farms, where he rode “his” horse, Major. Members of our Mission Teams from Christ United Methodist Church express their feeling that McKenna Farms is a special place, a place of tranquility even in the midst of a bustling farm therapy center. There is hope, and there is joy. Beginning early last year, my son, Eli, who has diagnoses of Autism Spectrum Disorder, Attention Deficit Hyperactivity Disorder, Type One Diabetes, depression and anxiety, and other anomalies, began taking therapeutic riding at McKenna Farms. A loving grandparent was paying for him to ride twice a month until over the summer, when she retired. As many other families with special kiddos do, we stretch every dollar while trying to provide the support our son needs to thrive. We love McKenna Farms and the staff, and especially the animals. We still stop by occasionally to say hello to his favorite horse, Gizmo. Eli loves that he and Gizmo neither like to shower and bringing Gizmo a carrot or an apple is a treat for both. Eli’s entire demeanor changes when we hop out of the car at the farm. He is suddenly calmer, more focused and driven . . . it’s like a peace washes over him while he is there. This makes me so happy. Eli’s entire demeanor changes when we hop out of the car at the farm. He is suddenly calmer, more focused and driven . . . it’s like a peace washes over him while he is there. This makes me so happy. We would love to provide Eli with therapeutic riding again. We would love to spend more time on the farm as well. There are few to no sports or activities that Eli has truly enjoyed like riding. We are not in a position to pay for lessons weekly or even biweekly and would appreciate any support you could lend us. Isaiah is seven, a camera shy, agile, and very much loved answer to a prayer. “Every year on my birthday I prayed for a child,” his mother, Candace, says. And on her birthday, two little boys came to live with her and her husband, a former Marine. 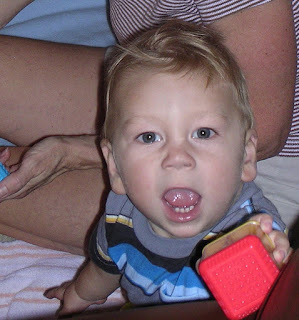 Isaiah was two when he and his brother were placed in their care. Their parents, relatives, were drug addicted, and Isaiah’s babyhood had been spent in a baby seat placed in front of the television. Neglected, they were removed by children’s services and placed in foster care. Isaiah was diagnosed with Pervasive Developmental Disorder, and was developmentally far behind. 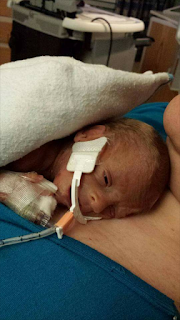 Candace and her husband sought help for Isaiah soon after he arrived home. He began receiving therapy. In 2013 he came to McKenna Farms. Now he’s thriving with the combination of therapy and love and care at home. Since Isaiah and his brother became part of their family, it has grown considerable. They now have seven boys, ages nine, eight, seven, six, five, four, and twenty-one months. All have been officially adopted except the baby, and they are in the process of adopting him now. “Isaiah is a completely different child from when we got him,” Candace tells us. “We’ve had him since he was two; he’s seven now. In the early years, he banged his head all the time. He was only able to say ‘Ehhhhhhh.’ He had fluid on his ears for the first year because he’d had no medical treatment for repeated ear infections. Now he has tubes in his ears. We love seeing a smile on his face! 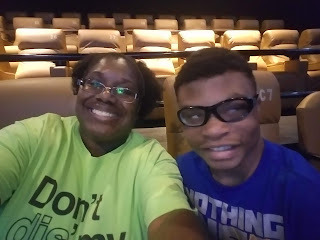 With love and therapy, Isaiah is discovering new things he can do all the time. His favorite song is The Gummi Bear Song. He hums in the car and asks his mom to guess what song he’s humming. He loves the scent of Candace’s hair, rubbing it on his face. He’s always been lovable. He loves to play outside and to ride the horses at McKenna Farms. Constantly in motion, he runs, climbs, and plays with his brothers. After all, he’s a seven-year-old boy. 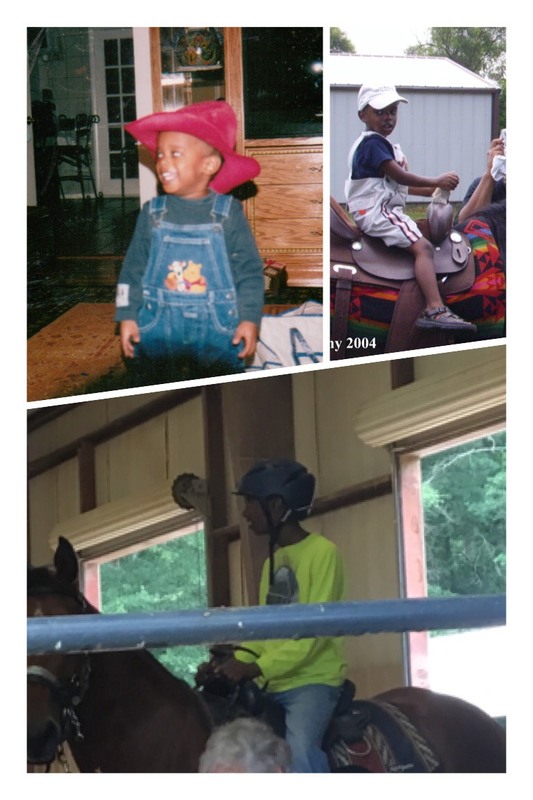 That’s what Jacob’s Fund wants for Isaiah and the other children we provide hippotherapy riderships for: to allow them to be what they can be, in the fullest way possible.